At the bottom of a hill, off a rust red dirt road, is a water pump by a clear running creek. This is Woolnoughs Springs, one of the 30 or so public springs in the region. It was ‘discovered’ by Europeans mid last century as a small pool of water surrounded by ferns under the canopy of towering white candle barks. Unlike the clear, sweet water in Kangaroo Creek, the spring water was slightly sulphurous and effervescent. Around about the same time the residents of Hepburn were concerned about the threat that mining and deforestation were raising for the mineral springs around town. Gold Rush immigrants from the Italian speaking part of Switzerland, they were familiar with mineral springs and spas and the connections people made with ‘taking the waters’ for their wellbeing and to cure ailments. They met in the Savoia Hotel in 1864 and wrote a petition to the colonial government to protect the springs. suggest the composition of the minerals dissolved in the water such as Soda Springs and Sulphur Springs. Other names refer to the regions where the settlers came from like Locarno Springs and further out in Hepburn Regional Park Argyle Springs and Tipperary Springs. 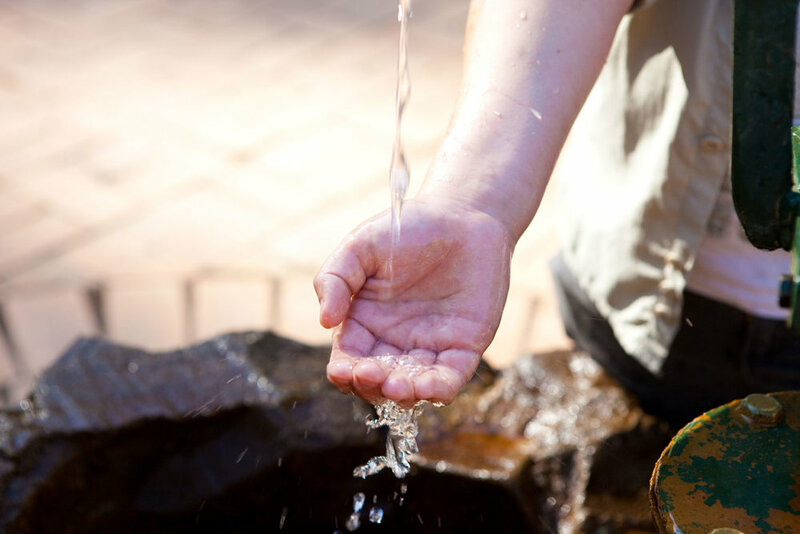 The regional and state governments understand the importance of the springs are to the people of Victoria and have invested a lot of money in recent years to make sure the spring water is available to everyone and safe to drink. 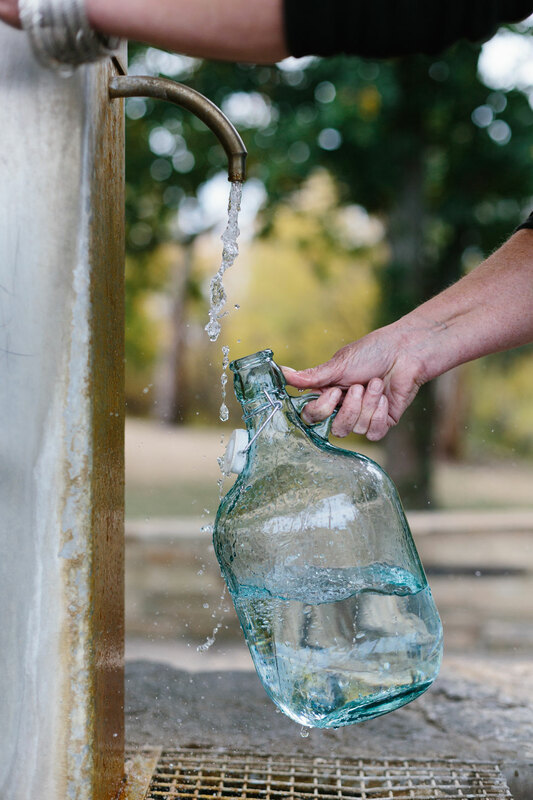 At Glenlyon Recreational Reserve, home to the local sporting teams and the shooting club, the springs can be found under the shade of old gum trees. Park the car and cross a small bridge over a little stream, home to croaking pobblebonks, to find the pump. The area around it is paved with stone and surrounded by a low stonewall. An early model Mercedes arrives and from it emerges two middle aged couples, arms filled with old apple juice bottles, stained brown from years of being filled with mineral water. They are from an outer suburb of Melbourne and make the trip up every 6 weeks. “We like this spring at this time of year,” says the wife in an accent from somewhere in the east of Europe. Her comment points to the fact that the taste of the springs changes depending on rainfall and changes in the underground in the aquifer. Glenlyon Springs are pleasantly alkaline with a whiff of sulphur and a tang of iron. Pleasant and obviously healthful as it is not the stuff you’d slam down fast to quench a thirst on a stinking hot day. There are the obvious roadside springs such as those at Kyneton with their Victorian era gazebos at the northern end of the old Calder Highway and the Sailors Falls Springs. It’s worth going to Sailors Falls to see the history of the old school house that stood there as well as the newly upgraded walk down into the Sailors Creek gorge. Upstream Sailors Creek plunges over a cliff made of basalt columns. It is quite spectacular after heavy rain. It is also worth heading out to places like Lyonville and driving through the forest to see the bunker like construction where Lyonville Springs spout from the concrete wall. The water here must be particularly good for you as it can smell like fizzy farts. You can get more refreshing drinks at the Radio Springs Hotel in town at Lyonville. My personal favourite is Woolnoughs Springs where the water is laced with fine bubbles and tastes just sulphurous and when served chilled with a slice of lemon is quite refreshing.